I've always liked Ledaig. There, I've said it. My first experience of it was the basic expression purchased from Morrisons some years ago. At the time I didn't know why I liked it, it was brash, in your face, as well as making me feel somewhat "dirty", it made me think of burned things, but I think my initial liking related to the fact that most of those around me didn't like it. In that sense, it allowed me to express a degree of individuality, to be different from the rest, and maybe to seem somehow more "knowing" than those who disliked it. Whatever the reason, I continued to drink it and looked for opportunities to develop my knowledge and experience of this fine spirit from the Tobermory distillery. 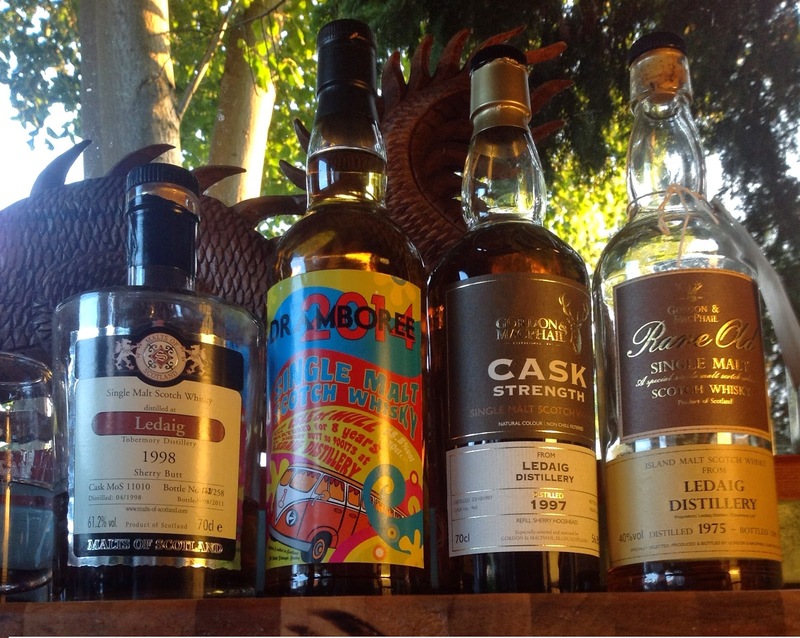 Over the last couple of years I've acquired a few different expressions and it was the visit of whisky buddy Jason @jasonbstanding to the whisky shed, who came bearing a wonderful old Ledaig expression, that prompted this piece. Let's start with this bad boy. I use the term "bad boy" advisedly given that this dram, in familial terms, reminds me of the nephew that you find somewhat irritating. You know the one, you're at a family gathering, there are brothers and sisters, children, aunt's, uncle's etc. Your own children are well under control, adhering to the parental mantra "don't show us up"...but the others....pulling the cat's tail, shouting, running about at high speeds, bumping into chairs, eating too much, whining, constantly asking for the toilet, generally doing the things that "you wouldn't see our kids doing". But let's be clear, this dram is not irritating, it's simply playing around in a somewhat youthful and uncontrolled way. It's got the genetic material that could lead to the more mature, well rounded, qualities of the wider Ledaig family but at present they are simply possible futures. Nose: Burning hay, earthy notes, spent log fires, vanilla and tar, quite raw. Finish: Short and quite dry. delightful Ledaig expressions, this is definitely the most basic. viscous, and still present after three or four minutes. line" integrated beautifully, but the sum is greater than the component parts....it's glorious! My mind wanders during the tasting of these lovely drams and I'm drawn into memories of the summer walks to primary school in the sixties, not a long walk, about a mile and a half in total. My mum and dad couldn't afford a car so the walk was an integral part of our daily routine. As part of the journey we had to pass Orford tannery, a Victorian/Dickensian, stained, smoke scarred, stuck with blood building, oozing thick, unctuous odours; smells and vapours that contorted the face, pulled the nostrils apart, wedged them open, and insinuated dread, fear, and primordial horror into the naive olfactory senses of our incomplete bodies. In the winter this wasn't a problem, the cold air deadened the dead, but in the summer, the languid passive aggressive heat slow cooked the edifice, and passing the Tannery necessitated a two hundred yard sprint accompanied by attempts to trip each other, with the aim of leaving one of our merry troupe simultaneously squirming, laughing and puking, stuck fast in the miasma of long dead animals. On those days when the wind direction and air temperature allowed a more leisurely stroll past the tannery, we would often pause and look beyond the weatherworn "Trespassers will be prosecuted" sign into the forbidden, mysterious tannery scrubland. Through the barbed wire fence we could see the lime pits....solid black pustulated ponds that generated many a scare story for us as kids. Fabricated, "excited child", bravado laden stories of bodies being thrown in, left to sink and dissolve, stories of narrow escapes, of being pulled from the pits before disappearing without a trace. Occasionally, we would be able to lauch hefty lumps of rock over the fence and into the nearest pit. The rock would hit with a resonant, onomatopoeic "perdunch", rest for a moment on the rippleless, tar-like surface before slowly dropping. It didn't sink, it was eaten by the pit, the thick, black, viscous lime jaws savouring the latest victim. More often than not, our activities were curtailed by the muffled, smoke choked, garbled ranting of the caretaker who we nicknamed "Peggy". We knew little of him other than he was, to us, incredibly old (in reality probably mid to late 60's), he had "fag" on the go constantly, he had a club foot (possibly due to childhood polio), and he walked with a profound limp. This combination meant he was not the most agile of caretakers, wheezing his way round the perimeter fence with a "Capstan full strength" or "Players No6" plume of smoke in his wake, uttering gutteral and threatening noises directed at potential (and hypothetical) ingressors. Once "discovered" we would switch our 8 year old limbs into "run mode", let fly a volley of abuse, each member of our gang trying to outdo the other in terms of the quality and offensiveness of our tirade, and scarper....making our way either on to school or home. ....it's amazing where a drop of whisky can take you! Nose: Rich, deep, pungent....leather, tobacco, someone's left some cheese behind the lowest shelf in an antiquarian bookstore....there's a wonderful decadence to the nose. Palate: Definitely a big hitter. The leather & tobacco notes continue onto the palate and are joined by fruit, wood and brine notes; it's a sumptuous combination! Finish: Lingering....fruit, peat, is that a hint of chocolate? This is the Black Sheep of the family. The mysterious, swarthy uncle who you've "been warned about". "Don't you dare go out for a pint with him....you know what will happen!" "Uncle Phil was never the same after that weekend!" and so on. He gets on well with the kids and seems to simply "tolerate" the other adults. He has the look of a man of stories, tales to tell, dark adventures, and a life immersed in chaos and danger. Not as viscous as the MoS but still a bit of a "glass hugger"
Finish: Med-long...lingering hints of liquorice. another dimension that is crying out for exploration. Nose: Now this is a different beast altogether. Perhaps "beast" is too strong a word, the nose is softer, more mellow. It contains what I would call the signature elements of the Ledaigs I have experienced but they are less pronounced. There is more perfume to this expression. It is gentle from the off, caressing the sides of the glass. Palate: The smoke & peat, whilst certainly not an afterthought, is not the dominant force that is evident in the other drams. There's vanilla, a slight musty, smokiness....everything is toned down....hints of marshmallow. At forty percent there's no "burn on entry", it's meditative sigh of a dram. This dram was a huge surprise to me. I admit to having a preference for slightly higher abv drams with certain "in your face" characteristics (all of which are present in the MoS, G&M, and Dramboree), but this expression had a seductive quality that charmed me. In terms of the Ledaig family, it is the sage, grandfather, slowly rocking in his favourite chair. It's blind master Po from Kung Fu, it's Obi wan, Yoda, Mr Miyagi, a sensei of a dram. There is none of the impulsive, wilful youth of the basic NAS, none of the "business like, aggressive drive and glorious ostentation of the MoS, Dramboree or G&M, There's a stillness and tranquility that is infectious, the dram sits you down, calms you down, allows you to breath. What a wonderful selection of drams. I'd certainly recommend them if you've not already had the pleasure.